Fully breathable one-piece belted brief style promotes less heat build-up against the skin, to help promote overall skin health for those with moderate to heavy incontinence. A design breakthrough for wearers and caregivers. Easier and quicker to change than traditional products. This unique belted brief is designed to minimize the need for lifting and has been proven to reduce the risk of back strain on caregivers, making changing less intrusive for the wearer. Wearers also appreciate the thin discreet design with InstaDri Skin-Caring System™ technology for outstanding dryness; the 100% breathable Air-Dry Layer™ backsheet that lets air circulate, preventing dampness on the skin and improving user comfort; the shape that leaves the hips and thighs uncovered, preventing chafing or sweatiness; and odor control for total freshness. 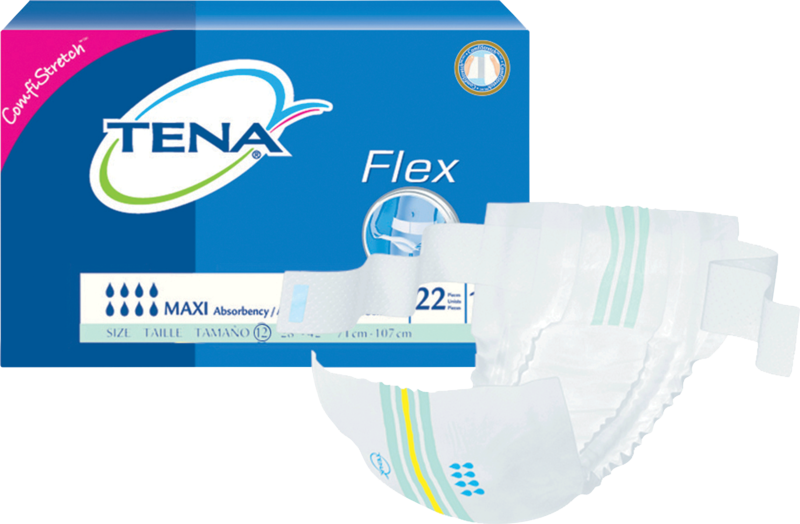 The Tena® Flex Maxi features the Eas-I-Select™ Guide: Color of stripe indicates size and the number of drops indicates absorbency level. All around air circulation Skin-Caring® backcover.